Upcoming software used in Apple devices will now give online shoppers a helping hand, thanks to the new credit card scanning function in iOS 8. Owners of the iPhone and the iPad who upgrade to the forthcoming iOS 8 software will be able to take a picture of their credit card using their device, which then enables the technology to scan their details and complete payment forms automatically. By converting the image into text using character recognition, this saves the user from manually entering their payment details – speeding up the checkout process. News of the latest feature was announced at the Worldwide Developers Conference in San Francisco on Monday. Additionally, the software will also see a new notification system that will allow people to respond without needing to open and move between apps. Yet while this may seem like a huge boost to Apple’s offerings, CNET reports that the tech giant is still behind major competitors when offering up other means of mobile payment. For instance, Apple has yet to implement near-field communications (NFC) – despite this being around for quite some time amongst Android users. 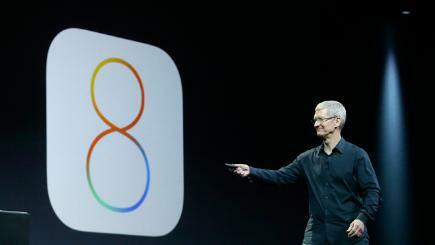 Other services the iOS 8 is set to support include an improved search facility in Spotlight, better group chat functionality in Messages, a QuickType system for the iPhone keyboard plus a family sharing app for families to share content (such as calendars and pictures) amongst one another.